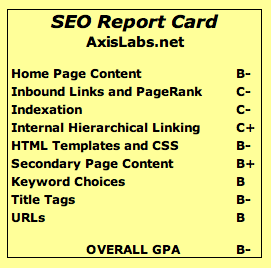 In this month’s “SEO Report Card,” I’ll look at the website for Axis Labs, a company that produces and sells nutritional supplements. Headquartered in Denver, Colorado, this private company went international in 2006 and now distributes to six of the seven continents. Axis Labs currently features a line of 12 nutrition and sports supplements designed to naturally enhance bodybuilding and weight loss efforts. These products are available through resellers like GNC and The Vitamin Shoppe, or can be purchased directly through Axis Labs’ online store. Axis Labs does a fair job of adhering to a keyword theme on its website, but the choice of keywords could be stronger. The terms “nutrition supplement” and “nutritional supplements” show up on the home page, but the phrase “nutritional supplement” (singular) is conspicuously absent. The phrase “nutritional supplementation” also occurs several times on the site, which is a wasted effort since very few (if any) folks would ever actually do a search for that. The Axis Labs home page has a reasonable amount of text, but the word “testosterone” only appears once. Myodrol, a testosterone booster, is one of the primary products that Axis Labs sells. But if you do a Google search for “testosterone booster,” Axis Labs doesn’t seem to be ranking at all (although one of its products does show up in a sponsored link from the reseller Bodybuilding.com). With any website, the home page is the most important as far as the search engines are concerned. The home page is the one that gets the most inbound links, the most page rank, and the most importance scoring. Targeting some appropriate keywords on the home page would give Axis Labs a good opportunity to pinpoint potential customers. Focusing on the word “testosterone” by itself may not be the best idea, as there’s a lot of competition for that keyword. In addition, “testosterone” as a search term is a bit broad—someone doing a search for it might be doing a school report or looking up information on pattern baldness and hair loss. However, targeting more specific keyword phrases like “testosterone supplement,” “testosterone supplements,” “testosterone booster,” and “testosterone boosters” could really give Axis Labs a boost (pun intended) in its search engine rankings. As I mentioned, the product pages offer a good selection of keywords, including the product type, which is what most folks will search for. For example, the page for “Clutch Whey Protein” features the phrase “whey protein” in both the title and H1 tag. While this is still a good practice, the fact is that the H1 is no longer a strong signal and just doesn’t carry the same juice it once did. However, in the source code the target keywords are high up on the page, which gives them good prominence. The bulk of the content for each product page is divided among four tabs: “Information,” “Directions,” “Testimonials,” and “References.” When you land on a product page, the “Information” tab is selected by default, and the content of the other sections is hidden until you click on the tab. On the Clutch Whey Protein page, the “Directions” tab actually contains a number of strong keywords (“dietary supplement,” “high protein,” and “protein shake”). If that text were being pulled in asynchronously when the tab was clicked, then the website would gain little or no benefit from those keywords. Fortunately, that’s not the case here. Even though the text is hidden from view when you first come to the page, the keywords are still visible in the HTML. Axis Labs makes good use of its title tags on some pages, not so much on others. A “site:axislabs.net” Google search brings up a list of all of its indexed pages. From the titles on the product pages, it’s apparent that it is including the brand name, the product type, and its company names (e.g., “Clutch Whey Protein by Axis Labs,” “Myodrol Advanced Testosterone Modulator by Axis Labs,” and so forth). Admittedly, it could benefit from making a few keyword changes—more people will search for “testosterone booster” or “testosterone supplement” than “testosterone modulator”—but overall, this titling convention on the product pages is a good practice. On other pages, title tags miss the mark. For example, a number of pages (e.g., resellers, terms, about us, careers, community) duplicate the title tag of the home page. The archived newsletters all have the same “Axis Labs Newsletter” title. And numerous photo gallery pages are titled only with a number. The URLs on the Axis Labs website are short and clean, but it’s missing a lot of keyword opportunities on the product pages. The URL for each product page features the brand name, but not the type of product. For example, the URL for the Clutch Whey Protein page is www.axislabs.net/products/clutch.html. Most people will be searching for this product by its type rather than its name, so it would behoove Axis Labs to work those terms into the URL (e.g., www.axislabs.net/products/clutch-whey-protein.html). In surfing around the site I discovered that all the links in the blog lead to 404 “Host Gator” error pages. I’m guessing there’s a misconfiguration in the rewrite rules. Should be an easy fix. In the meantime, these broken links make the site look less trustworthy and reliable in the eyes of Google. 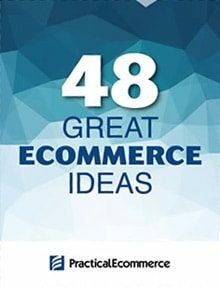 Not to mention the fact that all these valuable pages of content are getting dropped from the index (the engines discard pages that return a 404 status code). Speaking of status codes, a 302 redirect was found at www.axislabs.com pointing to www.axislabs.net. So if anyone is linking to the .com, those links may not be counting. It’s the same with axislabs.com without the www. And axislabs.net without the www doesn’t redirect at all, which looks to the engines like a duplicate home page. Did I mention also that the “Home” button links to www.axislabs.net/index.html instead of www.axislabs.net, which leads to yet another duplicate home page? These aren’t getting corrected with a canonical tag either. The good news is this is low-hanging fruit (to use consultant-speak). On a side-note, from a branding and conversion perspective I would think that the .com would look better to visitors than .net, so I’d suggest 301 redirecting from the .net to the .com rather than the other way around.